Do you LOVE guacamole? I mean, do you REALLY love it? Then you MUST try this quick and easy recipe--with some rather unique ingredients--to take to your next fiesta. Sure, it starts out as guacamole with mashed avocado as a base...but add a few things that might seem absolutely absurd, and this ends up being so amazingly delicious and strangely addictive. Nix the usual tomatoes, cilantro, and lime juice. 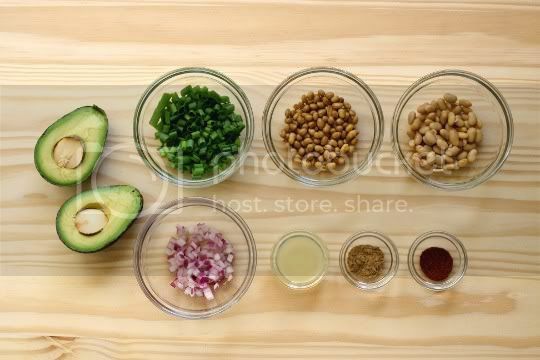 Instead, add green and red onions, lemon juice, and...soybeans and soy nuts. You can probably add any small white bean, but soybeans have the added health benefit, and they're small and conspicuous enough to not overwhelm the other ingredients. Soy nuts, the small round brown spheres, give the guac a surprising crunch and texture...enough that you probably can eat this plain like a salad, without chips! The red onions also give this a sweet, fresh crunch. But perhaps the most unusual ingredients are the spices and seasonings. Yes, salt and pepper should be added for flavor...but the two unique spices are chili powder and coriander. You'd probably never think to add something like this to classic guacamole, but let me tell you, it does wonders! The chili powder is perfect for that southwestern flair, but the coriander makes this reminiscent of an almost Indian-like cuisine. It makes the dish exotic, spicy, pungent, and sweet. In fact, I'd say this coriander was really what stood out...and what a great combination with the creamy, buttery avocado! 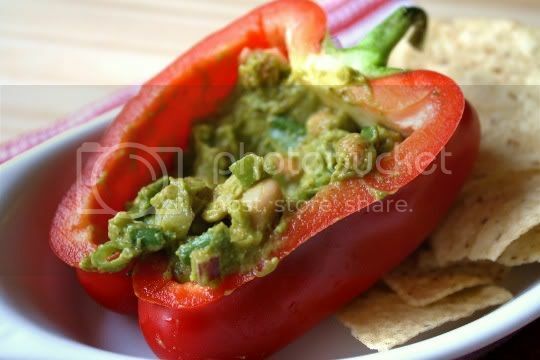 The recipe suggests serving this in hollowed-out red bell peppers, but I say don't waste your money (unless you're going for fun and colorful presentation). Just serve as you would normally, in a bowl surrounded by tortilla chips, veggies, or whatever else you can think of! Make again? 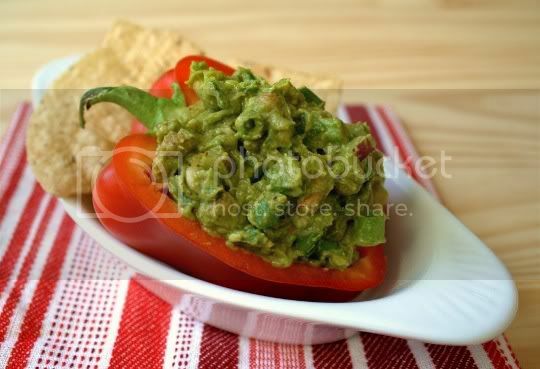 Yes...I'd love to serve this to guacamole lovers and shake them up a bit!